My name is Andrew Banks and I am excited to be a new member of the USk Chicago blog. 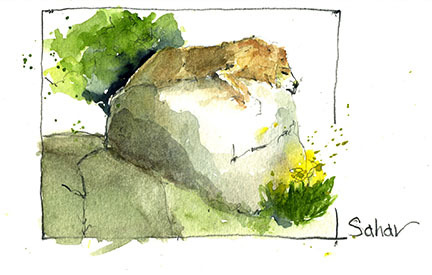 I've been a follower of the USk community for about 5 or 6 years now, but didn't really start contributing until earlier this year. I've really enjoyed getting to know many of you. I’m sure you can all relate, but I find it pretty awesome that I can put names to a sketch, even before seeing who posted it. Rich’s loose portraits that capture people’s facial expressions so accurately, yet so expressively, Adriana’s great use of bold colors, Wes’s great eye and often witty story telling through his sketches, Donald’s fascinating, and realistic ledger book art….I could go on and on. You really get to know a lot about a person through seeing their art! There’s such a neat variety of sketching styles in our group and I've been able to learn a lot from all the sketching and conversation that happens here. So, thank-you everyone. Anyway, here is a quick background to myself. Born and raised in Boston, MA., I've always spent tons of time in, exploring and enjoying city life. If anyone has been to the North End neighborhood of Boston, they will understand what I found so intriguing about urban life. The food, the smells, the history, the accents, the culture, the pride, the convenience… Needless to say, growing up a bike ride’s distance from Fenway Park, the ocean, and a beautiful urban fabric, definitely stuck with me all these years and has influenced where and how I live today. In 2005 I moved to the Midwest to study architecture. 2011 was big year for me. In the same year I graduated from Judson University in Elgin, IL. with a Masters of Architecture degree and married my beautiful wife, Becca. Since then, we have moved several times, but have always lived in the Lakeview and Buena Park neighborhoods. Why sketching? 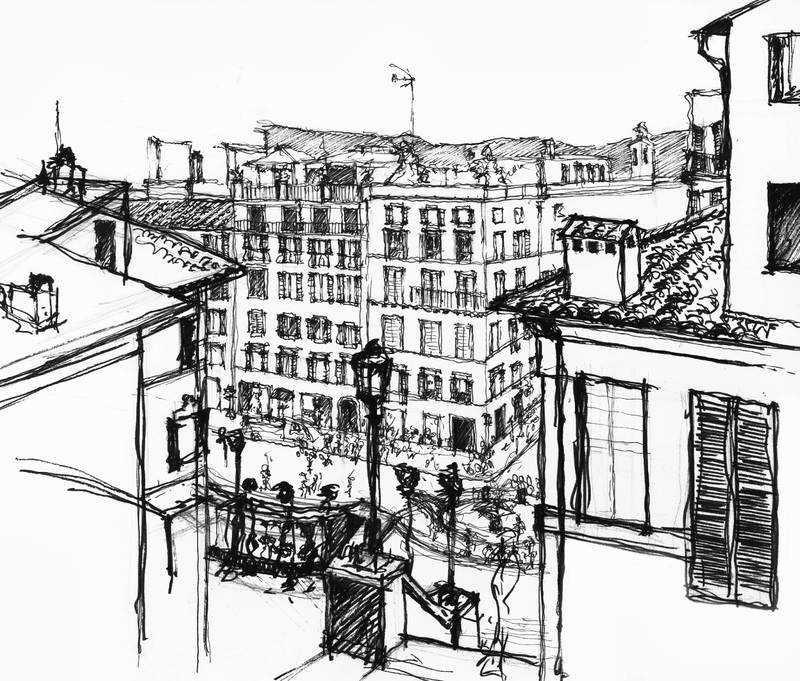 In 2008 I was fortunate enough to travel and study architecture in Europe for two months. I got to visit places like Rome, Venice, Florence, Bologna, Paris, Zurich, Zell am See Austria, Copenhagen, and Stockholm. While in Europe, our studies focused on ancient architecture and urban planning methods. Our classrooms were the cities, streets, piazzas, buildings, market places. We studied how urban spaces were designed and used centuries ago, and how they were and are still being used today. But most importantly, we studied what exactly makes them such successful, and desired urban spaces. 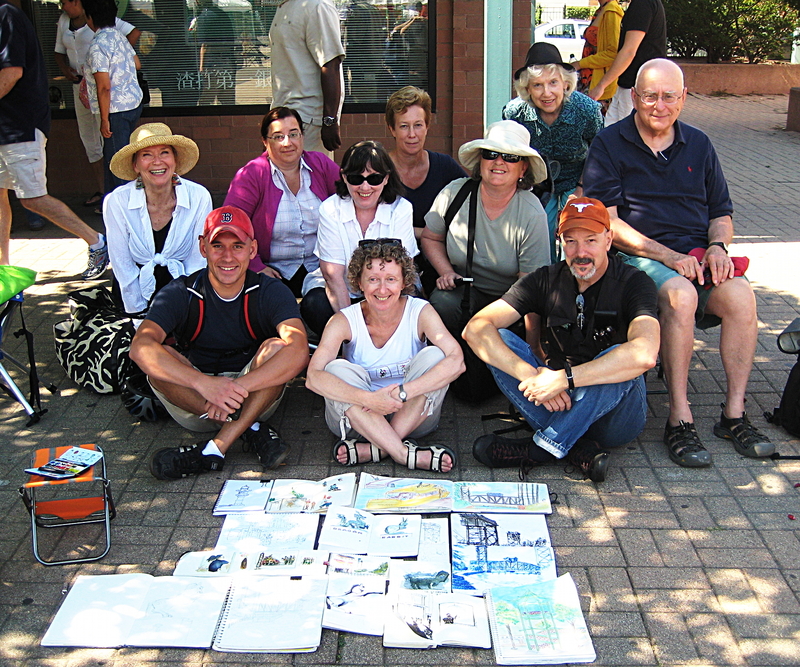 While we went on some guided tours and were lectured here and there, the primary way we learned was through sketching. For 8-10 hours a day, we walked the cities, sketching buildings, specific architect’s work, architectural patterns, diagramming and measuring spaces, and observing how people used public spaces. 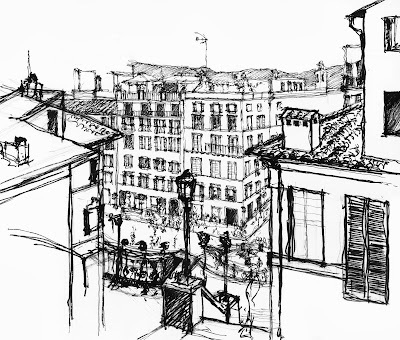 I like to think of this as my first real introduction to urban sketching. Five years later, much of what I learned on that trip has stuck with me and has inspired me to continue to sketch and observe urban life here in Chicago. Comparing the sketches I made on that trip to my most recent ones, I notice where my sketching has grown and improved since, yet at the same time, I am reminded of where my interest in sketching all began and why I enjoy it so much today. I recently made a career change and am in the process of starting my own business: Andrew Banks Illustration & Photography. 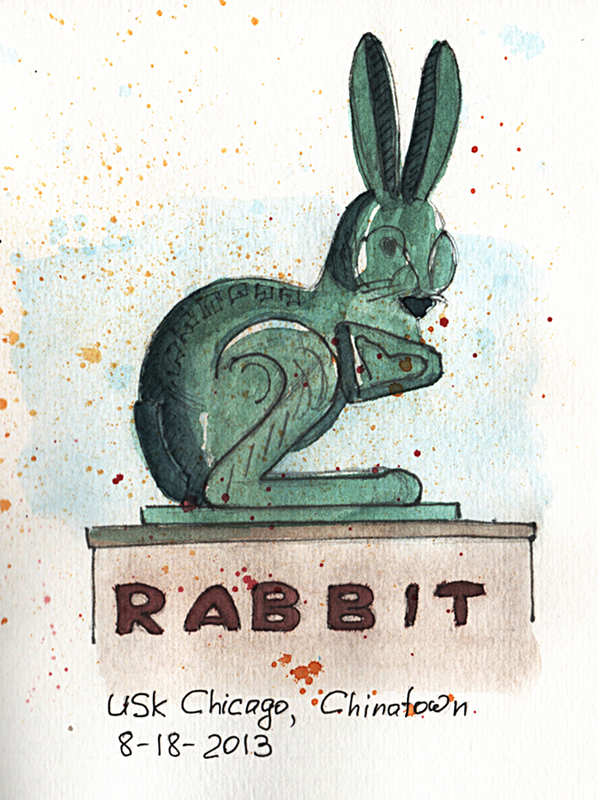 When you have a second, check out my page where I post my professional work, along with some of my urban sketches. I look forward to contributing to this blog and meet more of you here in the near future. Sketching the Villa Rotunda in Vicenza, Italy, 2008. Spanish Steps in Rome, Italy, 2008. 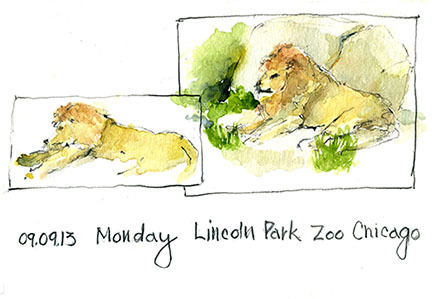 Lincoln Park: I couldn't make it to the July sketch crawl with USk Chicagol at the Lincoln Park Zoo but I was there on Monday. School is open and the children have returned to the classroom so the zoo was almost empty! There's a lot of construction going there - big plans to make a great place even better. Two year old Sahar's mane is just growing in and in between quick naps he proudly strutted his stuff! Remember the sketch meet in Chinatown? 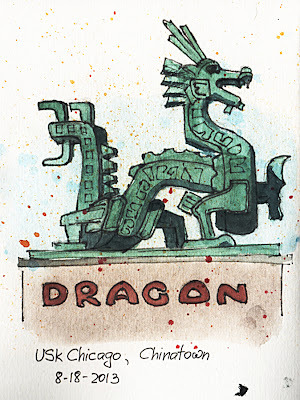 These are the two of the 12 Zodiac statues several of us drew. I think this was one of the most fun sketch crawls USk Chicago did. Check us out :)! There are beach hazard warnings today in the Windy City. I was running some errands this morning and had to stop and take a look. 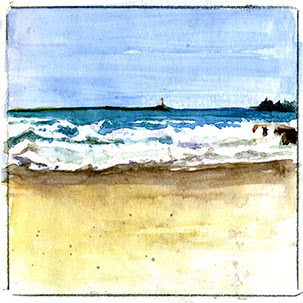 This is a quick 4 inch square sketch I did at Oak St. Beach. It's hard to believe it's just one block off the Mag Mile. "My Kinda Town Chicago is"! I love my little dog. I really do. So when you see me do something that looks like torture to the poor thing, please don't hate me. It's for his protection. I mean he squints in the sun and he swims in (ugh) lake water. So we got him these wonderful mini swim goggles, just like the kind Michael Phelps wears, right? Only Miles did not see the connection. In fact, I'm not really sure what he actually could see through those tinted orange lenses. If Superman's color of peril is "green" (Kryptonite), then surely my dog Miles' color of peril has got to be "orange" because once we strapped these on his head, he froze in place like we had just administered some kind of corporal punishment. So, long story short, we took the goggles off of him--right after I captured this image on my iPad. No, I didn't make him wait that long. I snapped a photo of him, threw off the goggles, or "doggles," and gave him hugs and kisses. Sketched on my iPad using the "Paper" app by fifty-three. Awesome app, by the way, in case you are thinking of adding the iPad to your Urban Sketch Kit. If you'd like to learn more about what I have learned on the iPad for sketching, send me a reply and ask away. 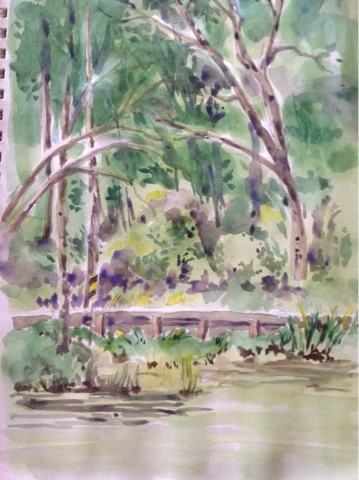 Sketching in the north woods. My brother and I are visiting family in Hayward, Wisconsin. We found a beautiful spot to throw down a blanket and sketch for hours. We had a wonderful peaceful time watching the clouds roll by, shooting photos, exploring the waters edge and sketching. Here are two results. 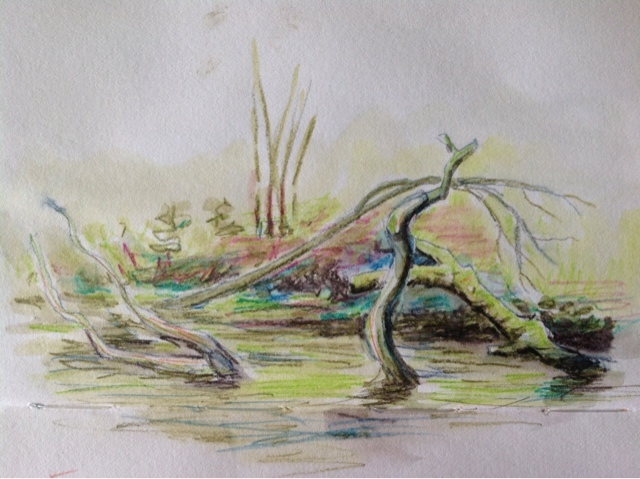 Intense pencils and water brush.